27 Sep 2018 --- The US Food and Drug Administration (FDA) has issued new draft guidance that will help determine when it is necessary and appropriate for retailers to be publicly identified when a food recall or outbreak is underway. Agency policy has prohibited the release of such information, citing considerations for “confidential” business relationships. Consumers, businesses, and others can comment on a draft of procedures for industry and the agency, The draft says retailers’ names and locations would be released to the public only under certain circumstances, a continuation of the agency’s practice of protecting Confidential Corporate Information (CCI). “FDA will primarily focus on those recalls where there is a reasonable probability that the use of, or exposure to, the food will cause serious adverse health consequences or death to humans or animals, which are also referred to as Class I recalls,” according to the draft guidance. “The draft guidance outlines the circumstances when the FDA intends to make public the retail locations that may have sold or distributed a recalled human or animal food. These circumstances will particularly apply in situations associated with the most serious recalls, where consumption of the food has a reasonable probability of causing serious adverse health consequences or death to humans or animals,” reads a statement issued by Scott Gottlieb, commissioner of the Food and Drug Administration. “The agency has not traditionally released lists of specific retailers where recalled foods may have been purchased. This is because certain supply chain information is confidential between the supplier and retailer. Moreover, in most cases, information publicized by the recalling company is sufficient to allow consumers to identify and avoid the recalled product,” Gottlieb says. “But there are some cases where additional information about the retailers selling a potentially harmful product may be key to protecting consumers such as when the food is not easily identified as being subject to a recall from its retail packaging and the food is likely to be available for consumption. It is particularly important in situations where the product has already been linked to foodborne illness. In these situations, providing retailer information can help consumers more quickly and accurately recognize recalled product and take action to avoid the product or seek assistance if they’ve already been exposed,” he adds. Based on this new policy, moving forward the FDA intends to publicize retail consignee lists for food recalls when the food is not easily identified as being subject to a recall from its retail packaging, or lack thereof, and if the food is likely to be available for consumption. Some examples of this may include foods sold directly to consumers with no universal product code or UPC, or bar code. This might include deli cheese, nuts, rawhide chews, or pet treats sold in bulk and fresh fruits and vegetables sold individually. Availability of this new draft guidance is the second in a series of policy steps that the FDA is taking as part of a broader action plan to further improve our oversight of food safety and the recall process. “Earlier this year, I committed the agency to further improve our recall processes because I believe that consumers should have actionable information for protecting themselves from recalled FDA-regulated products,” says Gottlieb. “As part of these commitments, we took an important step in January when we released a draft guidance on public warnings for consumers. It outlined situations where the FDA and firms would publicize public warnings to help carry out a recall. All of these actions are a part of our overall efforts to ensure more comprehensive and timely information reaches consumers. The agency has since been communicating sooner and more often on food safety issues that pose serious threats to the health of consumers. For example, the FDA issued a public warning earlier this year on imported crab meat from Venezuela as soon as we knew there were Vibrio illnesses in several states associated with that product,” he notes. The move was welcomed by Sarah Sorscher, Deputy Director of Regulatory Affairs at the consumer group Center for Science in the Public Interest (CSPI). “This information, long advocated for by CSPI, is necessary for consumers to understand whether they have purchased food that may be dangerous. Until now, the FDA has only released retailer information rarely and without a clear policy,” she says. “The US Department of Agriculture has long made retailer names available for all recalls involving meat and poultry that pose a health hazard, but the FDA has traditionally resisted releasing this information in all but the rarest cases. Last summer, FDA denied a request for retailer information on a specific outbreak as confidential commercial information. We hope this new guidance by the agency represents a significant change in policy moving forward and will lead to the publication of retailer names in all cases where this information will be helpful to consumers,” she noted. “While the new policy is a step forward, it is also essential that the FDA devote the needed resources to obtain retailer information swiftly from industry during high-risk recalls, so consumers can receive notice in time to protect themselves from foodborne illness,” Sorscher concluded. 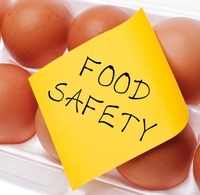 Food safety monitoring is on the rise amid this current marketplace. Just today we reported that Walmart is lauding the benefits of tracking lettuce and spinach through the supply chain using blockchain. The move is aimed at seriously ramping up food safety following US outbreaks of E. coli in romaine lettuce and salmonella in a number of products from eggs to breakfast cereal.